Our first Zva Creative blog hope was so successful that we decided to do more! This month, everyone is sharing projects made with new CHA goodies. I am hoping that you will take some time to join us for a little bit of fun! Zva is introducing 100+ brand new crystal and pearl embellishment designs at the show. All designs have a fresh new look and are available in various popular color choices. If you are attending, please stop by the Zva at Booth # 2991. The Blog Hop begins at Kim Hughes' blog: She is linking to one of the Zva designers and that designer is linking to the next and so on. There are 12 design team members, so be prepared to be inspired along the way. Hidden on 5 of the blogs is a Zva Creative prize package! Those blogs will be randomly chosen after the hop is over, so it's important to leave a comment on as many blogs as you can along the way. Our team is so wonderfully diverse, so we are hoping that you will be inspired when you reach the end. Here are three pages that I made with the new Zva goodies. This first one uses new blue and green flourishes. I love how long they are. I used the green silk flowers and cut them up to make shamrocks. I also used a cute new crystal mushroom. The next two pages feature Carolyn's daughters. She's the owner of Zva and kindly let me scrap her beautiful little ones since I was wanting to do some fun girly pages. This page uses some new pink and blue pearl flourishes. I love the flowers on the one at the bottom of the photo. This one uses several new products. I love the corner crystals that are new! There are also several pearl flourishes on here. They're all lovely!! Beautiful job! these are sooooooo beautiful!!!!!! I adore the bling words and all the crystal and pearl flourishes. OMG what a load of gorgeous layouts with all new ZVA products on them. Love every single one of them. Espescially the new pink and blue pearl flourishes. O and ofcourse the green and blue crystals, yummie!! TFS, hugs, Wendy. I'm loving all the different tones of bling swirls coming out. great projects!! Annabelle,you're a perfect design fit for Zva--beautiful! I had to laugh about your borrowing girls to scrap. . . I have a boy too, and sometimes I itch to play with more girl pictures! Beautiful pages! I love the corner crystals!!! That beautiful bling is on my wish list for sure! I enjoy seeing the bling on a "boy" page -- makes me want to try it! I love the pearl flourishes. Now i'm really in love, love the bling, the swirls..
Gorgeous! I love everything about them. The bold fantastic colors and all the wonderfully beautiful embellishments. what a beauties!!! Really love your lay-outs! The swirls look so devine! I love the layouts you showed us! Stunning layouts -- Zva bling on a page really takes it to the next level. Thanks! So, so pretty! I'm loving all your work . . . so clever (the shamrocks) and the mushroom TOO CUTE! Your pages are really gorgeous! love your beautiful work annabelle!!! so clever turning the green flowers into shamrocks!!! I really like the text flowers too. Love the way you have used the bling. oh my heavens! absolutely beautiful creations! So pretty. I want to put crystals on everything!!!! I'm especially partial to the pearls. I think they add such a vintage touch. Fabulous pages... love the way you incorporated those swirls into your lay-outs. TFS! Holy moly!!! Seriously amazing projects! I just love that little mushroom and the flourishes are truly beautiful... I know I'll be getting some. You really make beautyfull LO's. Have to put money aside to buy these lovely bling-bling. Heavens me. I always love your pages. You're so talented. The jewels are amazing. Great job Zva!!!!! Gorgeous! I really love the "BE" page. I love the little clovers and bling mushroom, too, on "Lucky". These new pearl flourishes and all the crystals, flowers butterfly and crystal mushrooms are soooo beautiful!! They are all lovely . . . I love the butterflies!! How do you not want to buy them all? Such a beautiful touch to all these pages! Wow! All ur work is fabolous! I love all the elements u use. All the new ZVA goodies look so great! what gorgeous pages! i really love that little mushroom! Just lovely ... love your use of the corner crystals. These are absolutely gorgeous, Anabelle!!! Absolutely fabulous!!! Love, Love the bling!!! What beautiful, sparkly pages, Anabelle! 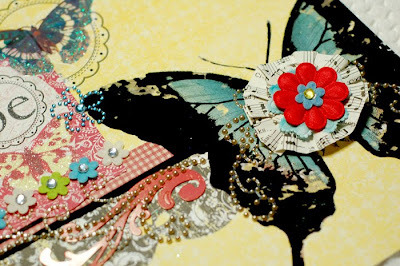 I love how you used so many different butterflies on that one layout! 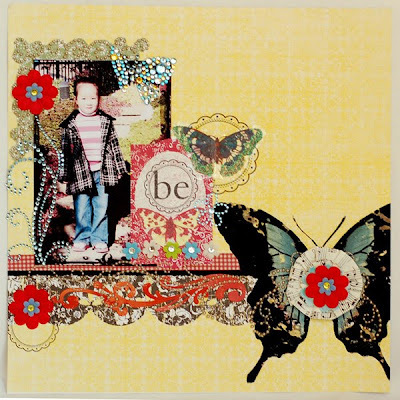 Fabulous layouts Anabelle! 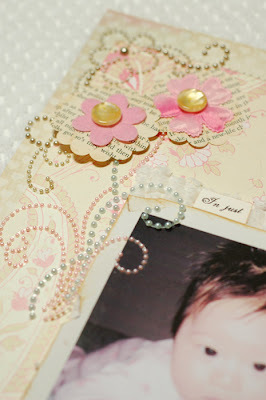 The jeweled and pearl flourishes you used are amazing....they work so well on these pages!! Great job! I LOVE the "rock band" feel of the last LO! I HAVE to HAVE those products to use on some of my son's pages! Those bling flowers are awesome. I love all the details you put into your projects! 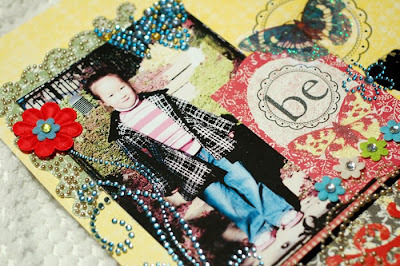 Like the way you used crystals on the boy-layout: it's bling, and still boy-ish! I love all the elements on the layouts. Really fun and inspiring. 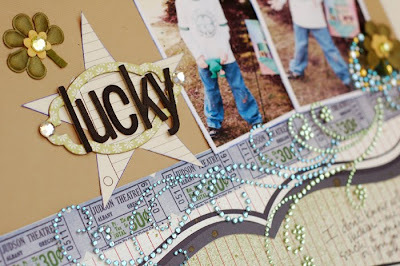 Love that you used bling on boy pages! lovely lo's ! the bling mushroom is so cute as well as the butterflies ! Amazing as always my friend, love that lucky page with Ryan!! Love that boy page, it's great to see bling on boy pages !!! All gorgeous layouts! I am very inspired by your talent! I love swirls and those are gorgeous! Beautiful although there is alot of bling bling it stays very soft and sweet. Wow.....your layouts are gorgeous, Anabelle. You really ROCK the Zva goodies. wowsa! Gorgeous projects Annabelle! Love all that new product! All of your layouts are lovely. I like your style. I love seeing the crystals on boy layouts! BE is an awesome awesome layout too! Love that mushroom. So cute. These are all so beautiful! So full of detail and eye candy! Oh my gosh!! What a great showcase of the new products. I love the way you used the mushroom! And I love the girly layouts, just so inspiring! Thanks so much for sharing! Wow, such wonderfull layouts you make! I really love your work! What great pages. Love the corner crystals. Your layouts are WONDERFUL, so so pretty! Gorgeous stuff....those new pearls look fab! I really like the sweetness of 100 Days and the great colors of Be. Very cool designs! Making me want to get back into the whole thing again...I need to get my supplies out! Just gorgeous! I love the petite flowers at the end of the flourishes!! Wow, these are lovely! Thanks for sharing your creations! what a great idea to create blings like that ! love it ! loving all the new products you were able to showcase in your beautiful layouts. Lovely use of the Zva products. You totally rock!!! All of your submittals are fabulous but I really love the middle layout. what a gorgeous little lady! And the Zva bling makes all of them pop! Thanks for the inspiration! love your flowers. i'm loving all the newsprint being used by everyone. 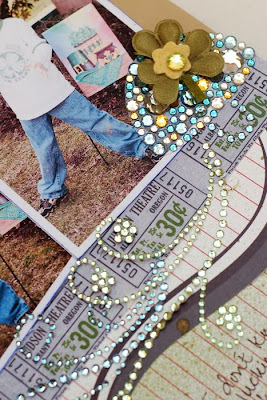 I love that you can use so much bling on a boy page with out it looking too 'pretty'. Thanx for sharing. Love the flowers and flourishes! All your pages are great. The corner flourishes are beautiful. love all the swirls and butterfly blings. The flowers are lovely too. 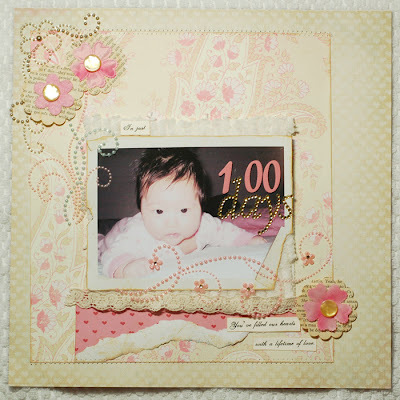 Love the 100 days layout. So gorgeous. Really love the pearl flourishes ! You always create such pretty layouts! 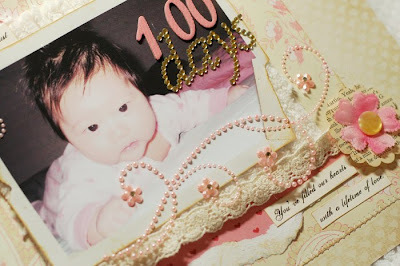 all are beautiful but my favorite is the pink 100 days page, it's gorgeous. These pages are all so different and each one is AWESOME! The bling is too cool! what great pages love your work. Love that mushroom!! soooo freakin cute! Love the girly scrapbook pages! Great job on all your projects! These layouts are so beautiful..........can't decide which I like best. Hmm I think the crystal and pink pearl flourishes captured my heart! You did such a great job: beautiful layouts! Love all the bling. What lovely projects you've made! love you're work. The bling bling makes it look great! All of your pages are stunners! Love all of the bling accents. Very beautiful layouts! Love the use of all the flourishes and bling. Really inspirational. i love the splays of crystals. i like the length of them. wonderfully used in these three projects. omg these are beautiful layouts! fantastic on the details! Beautiful beautiful work! Luv ZVA! All I can say is wow!! the beautiful creations on this hop are fantastic!! They're all so pretty but to be perfectly honest, the first one... There's something special about that one. It took my breath away. It's just DIVINE!! gorgeous pages - especially like the pink one! Gorgeous work!! I especially LOVE that butterfly! outstanding!!!! I love the multicolored bling!! I just can't wait.. I currently have a draw full of zva and Love every one I have. Can't wait for the new line to make its way up to Canada. I love your pages! They are all so lovely and full of fun bling! Awww! What cute kiddos! Great pages, Thanks for sharing! 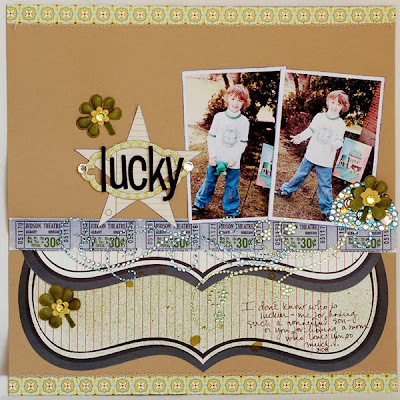 I really love your baby scrapbook page. Wonderful layouts. Isn't it nice to be able to 'share' kids. I LOVE the new crystal and pearl embellisment. So pretty. Thanks for sharing. Really great pages! Thanks for sharing! Beautiful, love the flower on the butterfly! These are all gorgeous. Maybe Carolyn will let me "borrow" her girls so I can make pretty pink stuff too! i love the butterflies and that first layout is so cool! These layouts are breathtaking. I love all of the details and layers you add to your pages. Love the length of the flourishes. those flourishes are gorgeous! love your use of them! you are oh so talented girl...stunning projects! !